Beautiful beaches (5 km), intimate bays, clear sea, and the tranquility of the inland of Istria; these are just a few components of a stay in apartment Nikolina, 5 km west of Rakalj. The small town lies on the western bank of the Rasa Bay, on the southeast coast of Istria and has a long tradition of pottery making. Perhaps a nice souvenir for those at home? The surroundings of Rakalj are rich in flora and fauna, and just beckons you to go on walking and cycling excursions. Do you like nice towns, intimate cafes and cultural settings more? Then there are more than enough possibilities! Pula (28 km) is definitely worth it; there you can still sample the Roman atmosphere. The imposing amphitheater in particular, which is still intact and one of the largest in the world - it recalls bygone days. Evenings in Pula are extremely enjoyable to eat a snack and of course, do some shopping! Other popular recommendations for excursions include the historic Rovinj (44 km), the beautifully situated Motovun (44 km) and Porec (65 km) with the beautiful Byzantine Euphrasian Basilica. Or catch the boat from Fazana (27 km ) to the protected Brijuni Islands. So much to see and do ... but oh is it great to come \"home\". 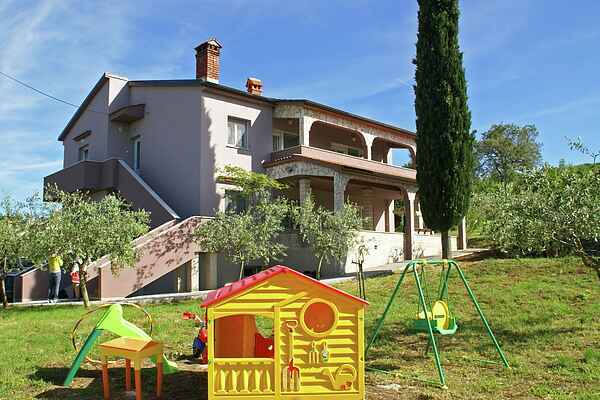 The children can have the time of their lives in the spacious communal garden (3000 m²). For small children there are various outdoor toys. The big kids can most certainly play tag and hide and seek among the olive trees. And you can have and excellent time enjoying the sun on one of the sunbeds. There is also a stone BBQ; so it'll come down to whether you use it or go out to eat? The nearest restaurant is in Krnica (3 km). A bakery and simple groceries in Rakalj (1 km). Other provisions can be found in Vodnjan (20 km) and Pula (28 km). The Nikolina apartments are situated on the outskirts of the village. The two spacious apartments are identical, both with a fresh and neat decor. Both apartments have Wi-Fi and a washing machine. Duvets. Parking is on the property. Krnica - MAXIMUM of 7 PEOPLE. The apartment is on the ground floor. Living room with comfortable seating area (including a 1 or and a double sofa bed), TV, and a door to the terrace. There is a separate kitchen with a dining area, fridge/freezer and microwave . Bedrooms 1 and 2: each with its own double bed. Bathroom with shower and toilet. There is a spacious covered terrace with garden furniture and a garden view.